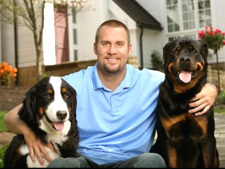 Today, Ben announced the seventh grant of the 2012-13 season from The Ben Roethlisberger Foundation at The Giving Back Fund. The Foundation will be distributing a grant to the Baltimore Police Department where the Steelers will play the Ravens on Sunday, December 2nd. The Baltimore Police Department plans to use the funds to add a bomb-detecting dog to their K-9 unit and to purchase a bite suit for training purposes. Ben answered questions from the media today about the progress of his injured shoulder and rib, his ability to practice, and his arm strength as the team prepares for their showdown with the Ravens. You can watch video from the Q&A here. UPDATE: On Friday, November 30th, the Steelers announced on their website that Ben “has been officially ruled out for Sunday’s game against the Baltimore Ravens”.